If I taught someone to play golf I would not check what they have learned with just a written test. I would want to see more direct, authentic evidence. I would put my student out on a golf course to play. 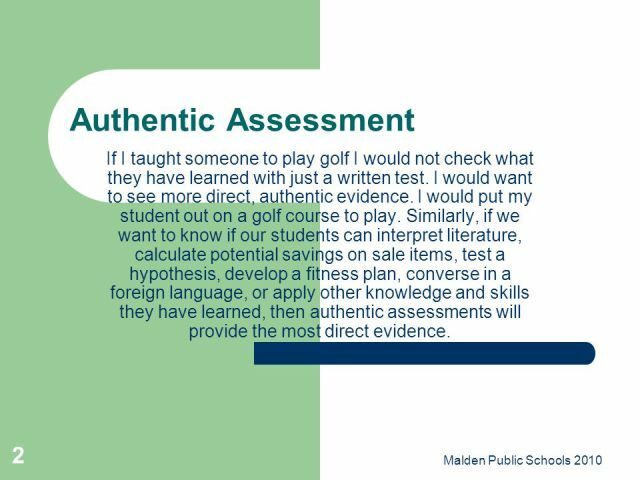 Similarly, if we want to know if our students can interpret literature, calculate potential savings on sale items, test a hypothesis, develop a fitness plan, converse in a foreign language, or apply other knowledge and skills they have learned, then authentic assessments will provide the most direct evidence. Malden Public Schools 2010.